From the director of The Fugitive comes a riveting, turbo-charged crime thriller starring international action star Chuck Norris (“Walker, Texas Ranger”). Exploding with heart-stopping chases and lethal martial arts confrontations, it’s an adventure that pits an honest cop against two vicious crime lords and his own department. Eddie Cusack (Norris) is a Chicago detective who plays by his own rules which is a dangerous habit, especially when he breaks the force’s “code of silence” to blow the lid off a deadly police cover-up. Now an outcast, he receives little help from his embittered fellow officers when he’s hurled into a blistering battle against rival drug kingpins. But Cusack is a one-man army, waging war on the criminals with his razor-sharp wits, lighting-fast karate moves and a special surprise: “Prowler,” a remote-controlled, rocket-equipped tank! Chuck Norris Fact: A Handicap parking sign does not signify that the spot is for handicapped people. It is actually in fact a warning, that the spot belongs to Chuck Norris and that you will be handicapped if you park there. Chuck Norris stars as Sergeant Eddie Cusack, an honest cop that has become something of a pariah within his own police department because of his stance against corruption and especially his dislike of Detective Cragie (Ralph Foody). Despite Code of Silence being directed by Andrew Davis who would later become one of the best action directors around (The Fugitive, Under Siege), the movie never rises to its potential. Sure, it makes Chuck Norris stretch a little bit, like comforting a young woman and going to an art gallery, but it should be have been a lot better than this with Davis behind the wheel. If Davis can make Steven Seagal look good, there’s no reason his magic shouldn't work with Chuck Norris. The movie opens with Cuscak and his fellow Chicago detectives preparing for a long planned sting operation to take place. They are spread out across a neighborhood while they wait for their informant to be taken to the buyer’s location so the conversation can be recorded so they can go into action. The deal starts off well, with the informant being taken into see Victor Comacho (Ron Henriquez) who is representing the Comacho gang. Just when Cusack and his men are about to make their arrests, another faction makes their play. A rival mafia gang led by Tony Luna (Mike Genovese) ambushes and kills the Comachos and the informant before taking all of the money and drugs left on the table. Cusack and his men try to storm the room but by the time they get there, Luna and his men have already left and are in the process of making their escape. Cusack and his partner Dorato (Dennis Farina) chase them and Dorato’s foot is wounded and the gang makes a clean getaway. Making matters worse, Detective Cragie mistakenly shoots an unarmed teenager who wasn’t involved at all and then plants a weapon in the teen’s hand to cover himself which is witnessed by his rookie partner Nick Kopalos (Joseph Guzaldo). The failed sting operation doesn’t go well at headquarters and Cragie is delegated to desk duty while he awaits a department hearing on the shooting. Craigie maintains his innocence and Kopalos toes the line as he doesn’t want to go against his senior partner. With Cragie out of the field, Kopalos is assigned to work with Cusack while his own partner Dorato recovers from his injury. Cusack is ordered to find out who ambushed the Comachos before the gang does to prevent a gang war in Chicago. Cusack’s reputation with his fellow officers sinks even lower when he refuses to sign a petition on Cragie’s behalf since he believes the man to be dangerous and that he should be taken off the streets. Meanwhile, Tony Luna is a little worried that his strike against the Comachos could come back to bite him so he asks his brother Lou Gamiani (Lou Damiani) to watch over his daughter Diana (Molly Hagan) and his family while he lies low. He knows that Louis Comacho (Henry Silva) is looking for him to get revenge after he survived the ambush, so he plans to skip town until things cool off. Luna isn't aware that Gamiani is already under surveillance by Cusack and his team which ends up exposing Diana as his daughter when Cusack watches her argue with Gambiani when he goes to see her at the Lincoln Park Zoo. It doesn't take long before the gang war between Luna’s mafia and Luis’ Comachos begins with each side brutalizing the other. Diana is take hostage by Comacho in a bid to lure Luna out of hiding. Cusack finds himself in the middle of a gang war and with no backup from his fellow police officers to help him save Diana and the city from the war that’s about to happen. 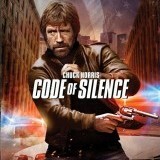 Code of Silence has one thing that most Chuck Norris movies don’t have and that’s an actual plot. This story of rival gangs going to war with one man caught in the middle is a good one and the other twist of him being ostracized from his own people makes it even better. If this had been cast with Harrison Ford this really could have been a great movie. As it is, with Norris not being the most emotive of actors and Davis not up to his usual high standards, the movie is decent but not great. One positive thing that it does have going for it is the film’s supporting cast that includes Henry Silva, Dennis Farina, Ralph Foody, and Ron Dean. Many of them were good enough that Davis would hire them again in his later movies like The Fugitive. Code of Silence tries to be more realistic than the usual Chuck Norris movie until the end where all of that is thrown out of the window. Between a remote controlled mini-tank and Cusack taking on about thirty guys at once (but they’re considerate enough to attack him one at a time), any points the movie might have made for its restraint earlier is cashed in. This film’s 1080p (1.85:1) transfer doesn't fare as well as Chuck Norris’ other recent release of Lone Wolf McQuade (see my review here) as this one looks hardly untouched since the last time it was issued on DVD. The entire transfer looks washed out and hazy and there is a lot of heavy grain throughout the movie. Colors are muted and details are crisp as a general rule but improve slightly during close-ups. Flesh tones aren't consistent and black levels fare poorly as well. There’s also specks and other blemishes that pop up during the movie which doesn't help. While I’m sure that this transfer is an improvement over the previous DVD release, it can’t be by much. Code of Silence’s DTS-HD Master Audio Mono track is also a letdown with a basic no frills track that does the job but that’s it. I’m not sure if it’s the source material that couldn't improved upon or if it’s just this track, but it lacks clarity which affects the dialogue and sound effects which sound fairly weak. That’s not even consistent as in some parts, the sound is ratcheted up (like the fight on the train or the ambush in the opening sequence) while others barely register. This mix isn't immersive at all which is a shame because that might have helped the movie. The only extra on this disc is the film’s theatrical trailer in HD which is going to bring the final score down. I will admit that I did enjoy some of the fighting sequences and especially the fight that takes place on top of a moving elevated train that Norris apparently really did. It’s the stunts like that one that keep me watching these movies. The movie had a good concept but it didn’t execute it as well as it should have done. It’s also unfortunate that this Blu-ray doesn’t offer a better audio and visual presentation as well as some extras. It’s still better than a DVD but more effort should have been spent on this release.